What is Filorga NCTF 135 HA Meso Kit Needling 1mm? Filorga NCTF 135 HA is a mesotherapy solution made of vitamins, minerals, amino acids, coenzymes, nucleic acids and antioxidants. Its mesotherapy needling kit comes with a dermaroller. Doctors use this mesotherapy treatment to help rejuvenate the look of skin with a minimally-invasive treatment. 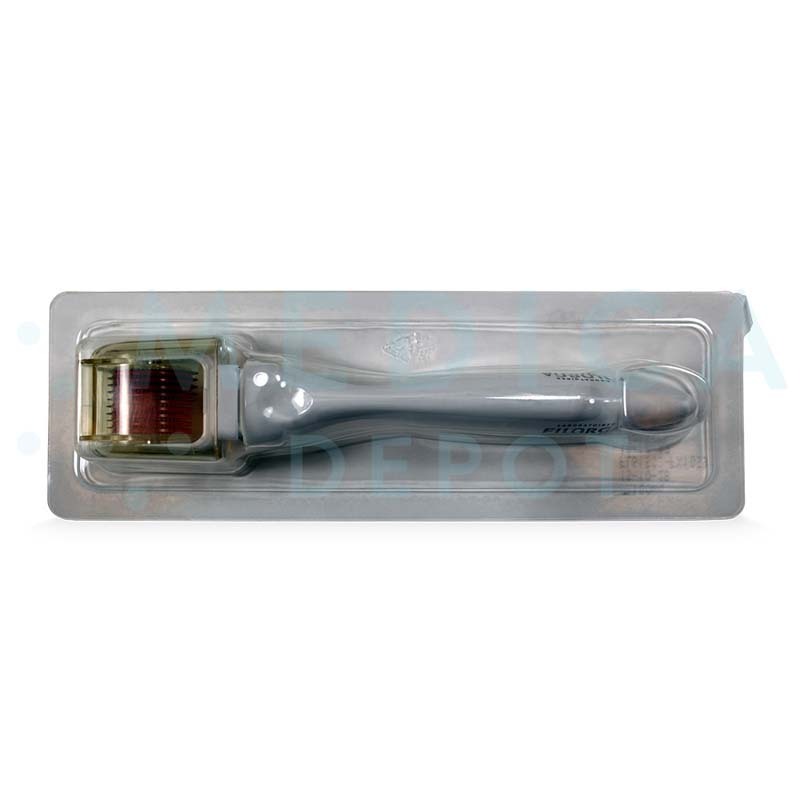 As the dermaroller punctures the skin, it delivers the polyrevitalizing cocktail while helping stimulate collagen and elastin growth for improved skin texture and firmness. Where can I buy this mesotherapy kit? 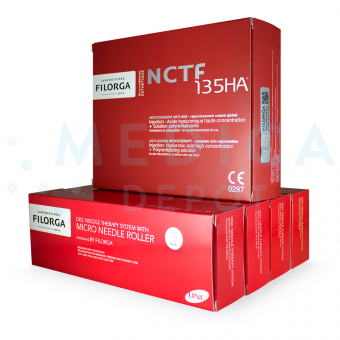 Purchase Filorga NCTF 135 HA Mesotherapy Needling Kit online from Medica Depot. While enjoying the convenience of ordering this and other aesthetic products online, you also benefit from low, wholesale prices when buying in quantities from 1 to 100. 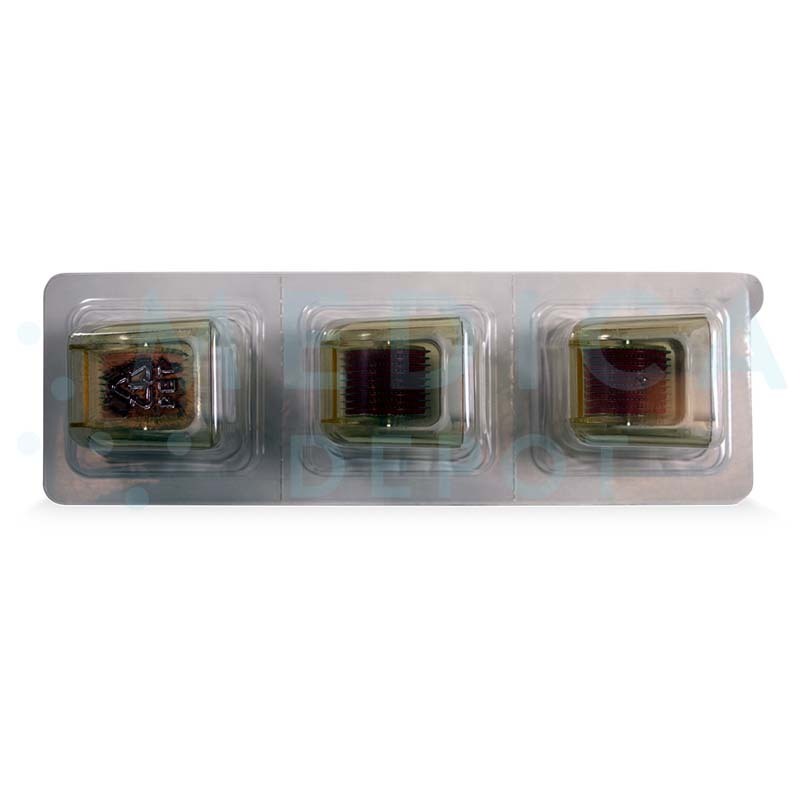 Buy this and other genuine brand-name mesotherapy treatments online, by phone, or by fax. What comes with this product? And 1 roller product leaflet. What are the benefits of this mesotherapy needling kit? Genuine, brand-name treatment from Filorga, trusted for their innovative skincare and dermal filler products. Includes hyaluronic acid, a natural substance trusted for its anti-aging benefits. Extra ingredients help stimulate vital cell functions, catalyze biochemical reactions, assist cellular communication, provide building blocks needed to produce collagen and elastin, and reduce free radical synthesis. Roller device is minimally-invasive, not requiring the use of injections. Treatments are practically pain-free and risk-free. How does Filorga NCTF 135 HA microneedling work? This microneedling kit includes dermarollers, which have small, sharp points to puncture skin in a treatment called collagen induction therapy. Small needles cause micro-injuries in the skin, and the body mounts a healing response to these injuries. As skin heals, the body releases chemicals to encourage skin cell growth and stimulate collagen and elastin, improving the skin's thickness and elasticity. The microneedles do not puncture the skin as deeply as a regular needle, making these treatments a safer and less-invasive alternative to dermal filler or botulinum toxin treatments. In addition to the mechanical action of its dermarollers, this microneedling kit includes a polyrevitalizing solution. Hyaluronic acid is known for its ability to restore hydration to dry, aging skin, holding onto moisture to keep skin looking refreshed. In addition to hyaluronic acid, the polyrevitalizing solution contains 53 other active ingredients to target skin aging. Its 14 vitamins, including A, B, C, and E, help nourish skin, stimulating vital cell functions; its 24 amino acids help provide the building blocks the body needs to construct essential proteins, including collagen and elastin; its 4 minerals provide skin with essential ingredients for dermal health; its 6 coenzymes catalyze biochemical reactions within the tissues, supporting the skin's natural ability to heal and grow; its 5 nucleic acids help activate cellular communication, keeping skin cells functioning well; and its 2 antioxidant ingredients reduce free radical synthesis to protect skin from oxidation damage. The microneedles help deliver these helpful nutrients into the dermis where they are needed. What are the ingredients in Filorga NCTF 135 HA? This polyrevitalizing solution contains non-crosslinked sodium hyaluronate (hyaluronic acid) with 12 vitamins [Ascorbic Acid (Vitamin C), Biotin (Vitamin B8), Pantothenic Calcium (Vitamin B5), Folic Acid (Vitamin B9), Inositol (Vitamin I), Nicotinamide (Vitamin B3), Pyridoxine (Vitamin B6), Riboflavin (Vitamin B2), Thiamine (Vitamin B1), Tocopherol (Vitamin E), Retinol (Vitamin A), and Vitamin B12], 6 minerals (Calcium Chloride, Potassium Chloride, Magnesium Sulphate, Sodium Acetate, Sodium Chloride, and Sodium Dihydrogen phosphate), 5 nucleic acids (Deoxyadenosine, Deoxycytidine, Deoxyguanosine, Deoxythymidine, and Methylcytosine), 23 amino acids (Alanine, Arginine, Asparagine, Aspartic Acid, Cystine, Glutamine, Glutamic Acid, Glycine, Histidine, Hydroxyproline, Isoleucine, Leucine, Lysine, Methionine, Ornithine, Phenylanine, Proline, Serine, Taurine, Threonine, Tryptophan, Tyrosine, and Valine), 6 coenzymes [TPP (Cocarboxylase), CoA (Coenzyme A), FAD (Flavin Adenine Dinucleotide), NAD (Nicotinamide Adenine Dinucleotide), NADP (Nicotinamide Adenine Dinucleotide Phosphate), and UPT (Uridine Triphosphate)], and 2 antioxidant agents (Ascorbic Acid and Glutathione). What is the difference between this mesotherapy product and a dermal filler? Dermal fillers are gels made of hyaluronic acid, which add volume to the dermis. Mesotherapy products, on the other hand, are made of liquid hyaluronic acid with other helpful ingredients for improving skin health. Instead of physically adding volume, these mesotherapy solutions help hydrate and stimulate collagen and elastin growth for improved skin elasticity and reduced wrinkles. Although dermal fillers, and some mesotherapy treatments, involve injections into the dermis, this mesotherapy solution is delivered using a dermaroller to make shallow punctures in the skin. First, cleanse the patient’s face and hands, using deep cleaning or scrubbing to help maximize the roller's effect. Then, roll the microneedling head back and forth across each area of skin once, avoiding the eye area, the mouth area, and other thin-skinned areas. Apply the hyaluronic acid solution and leave it on for 5–10 minutes to absorb into skin. When should I use this rejuvenating treatment? This treatment should be used to revitalize the skin. Use the dermaroller about once a week to maintain results. Results can be long lasting, as this treatment stimulates skin repair. However, for maximum results, the dermaroller should be used weekly. What areas of the body can I treat with this mesotherapy solution? Use this treatment on the face, neck, decolletage, cleavage area, hands, inner thighs, arms, and abdomen. Who is an ideal candidate for Filorga NCTF 135 HA Dermaroller treatments? The ideal candidate for these treatments has early signs of aging, such as fine lines and skin that is beginning to lose its elasticity. Why should I purchase Filorga NCTF 135 HA Mesotherapy Needling Kit? Purchase this skin-rejuvenating kit to help your patients maintain and improve the youthful look of their skin, restoring elasticity and a smooth texture. NCTF 135 HA is made by Filorga, a French manufacturer trusted around the world for their skincare products, so you and your patients know you can rely on this mesotherapy solution to provide quality results. The inclusion of a dermaroller gives your patients a safer, less-invasive option to needles, while the unique polyrevitalizing solution gives your patients a variety of ingredients for their skin health. 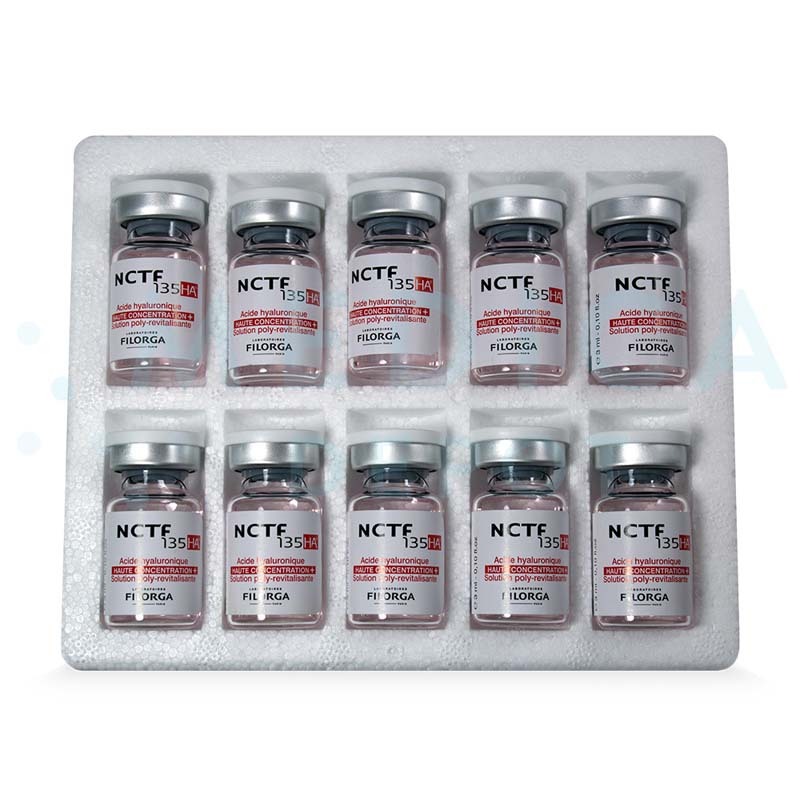 Most of all, by purchasing Filorga NCTF 135 HA Meso Needling Kit from Medica Depot, you save money with low, wholesale prices. What are Filorga NCTF 135 HA's side effects? Side effects can include redness, mild local inflammation, and small hematomas. These side effects usually disappear within the first 2 days after treatment. These may not be all the possible side effects of treatment with this product.